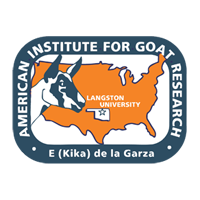 Twelve milking Alpine does were randomly selected from the Langston University herd to determine the daily variations of milk somatic cell counts (SCC), composition and production. Composite milk samples were collected daily at evening milking from mid-March (2-3 weeks in lactation) to mid-August (drying-off) in 1995. Milk samples were analyzed for SCC using a Fossomatic cell counter and for chemical composition using a Dairylab II milk analyzer. Both instruments were calibrated with goat milk standards. Concentrations of all milk composition variables (fat, protein, solids-non-fat and total solids), with the exception of lactose, were high (2.91 ± 0.16%, 3.27 ± 0.10%, 8.30 ± 0.11% and 11.20 ± 0.23%, respectively) in the first month after parturition, declined slightly and then remained constant until drying-off. Daily milk production increased steadily for first 4 weeks following parturition and then decreased gradually. SCC in milk were high 887 ± 400 × 103 mL-1) during the first 2 weeks of lactation. The lowest SCC were found in milk during the second month after parturition and then the SCC value increased as lactation advanced. Marked daily variations of SCC in goat milk were observed. These observations indicate that consecutive monthly SCC data collected from the once-a-month sampling plan of the Dairy Herd Improvement Association testing program must be used if the SCC is to be a direct estimator of mastitic conditions in Alpine goats.